I’m constantly tiptoeing the line between healthy food and food that others actually want to eat. For the record, my friends do like the food I create, but they also crave those classic fatty comfort dishes…especially during these blasted cold months. In this comfort-dinner redo of classic spaghetti and meatballs, swapping sweet potatoes for pasta may seem completely out in left field, but when quickly sautéed in a touch of butter these faux “noodles” are delightfully chewy and satisfying. Yes, I did say butter. Once in a while a touch of high quality butter really does the trick (though ghee, olive oil or coconut oil would all work as well). Let’s talk meatballs for a moment. I lightened up the beef by using ground turkey and totally ramped the nutritional value with mushrooms. Then I have the whole blast of Moroccan flavor using ginger, garlic, cilantro and raisins. 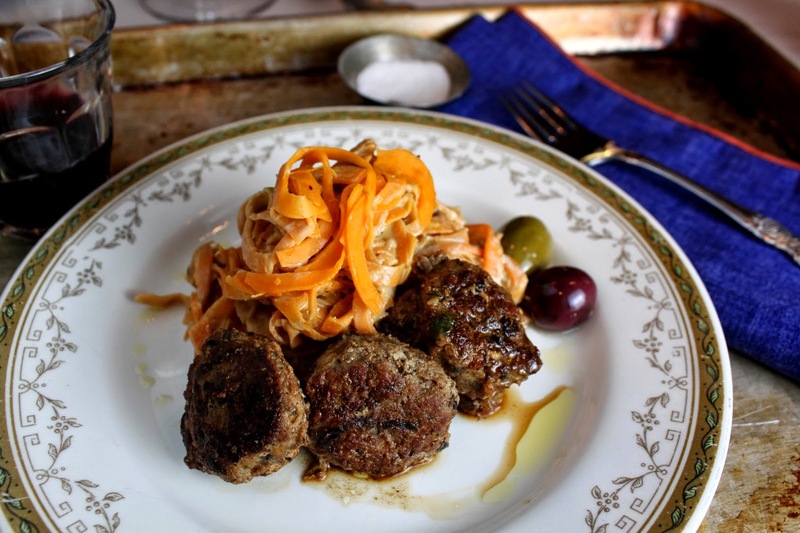 The meatballs are delish and get even better the next day. Have your classic comfort foods, just upgrade them. You’ll still be warmed from the inside out but without the heavy part. Melt the coconut oil over medium heat. Add in the shallot, garlic and ginger and cook to just soften the shallots, about 3 minutes, tossing often. Add in the cinnamon, coriander, cumin, salt and pepper. Stir well. Add in the mushrooms and cook until the mushrooms are wilted, about 5 minutes. Set aside and cool. 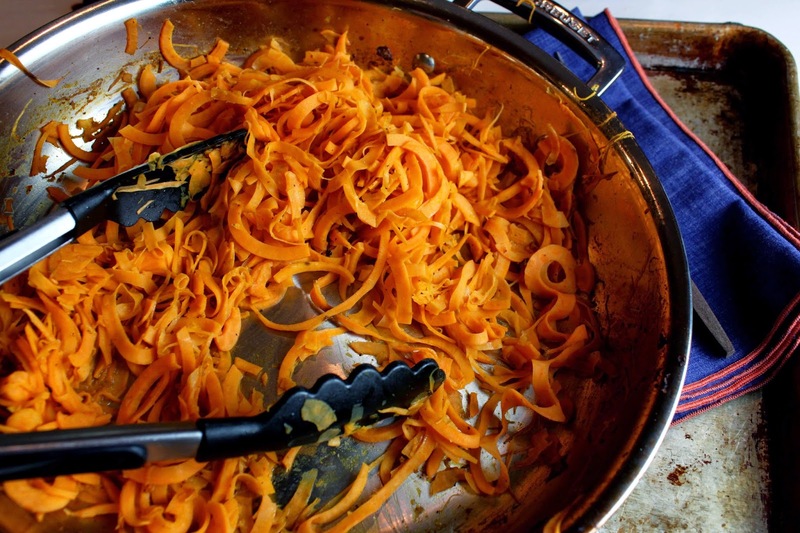 Spiralize the raw sweet potato while the mushroom-turkey mixture is cooling. Set aside. Heat the oven to 250 degrees. Place a foil covered pan in the oven (to hold the meatballs warm while cooking all of them). Reheat the mushroom pan to medium and add a bit more coconut oil in. Drop spoonfuls of the turkey meatballs into the hot pan (don’t try to form them in your hands) and cook until golden on the first side and then flip. Place in the oven pan to keep warm. Cook the sweet potato: Melt the butter over medium-high heat, add in the sweet potato noodles, a pinch of salt and pepper and toss well. Continue to toss, 5-10 minutes until the potatoes are just fork tender. 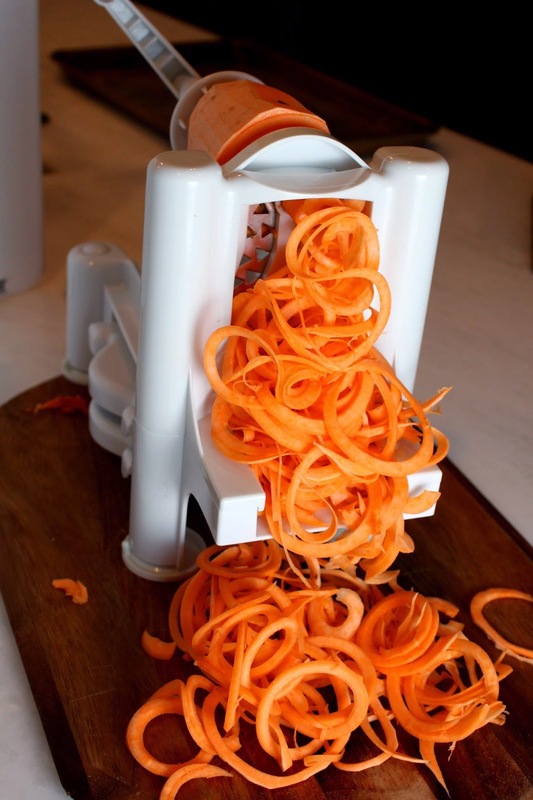 Happy Healthy Tips: A spiralizer is key to make noodles out of the sweet potato. If you don’t have one, use vegetable peeler to shave off larger noodles or slice the potato into thin layers and then slice into small matchsticks. For more recipes, go to Monique’s blog: FatandHappyBlog.com and Monique’s new site,HappyEatsHealthy.com.